MALMO, SWEDEN: Of course when we think about visiting Sweden, first thing comes to our mind is Stockholm. 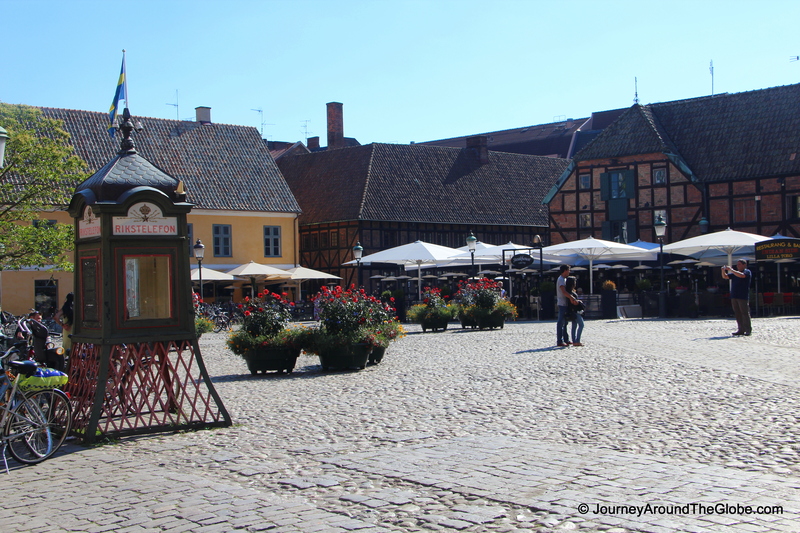 But the small Swedish towns that we’ve visited in our trip this time were truly unforgettable. They may not have hundreds of people going in one direction to visit something extra-ordinary or world-famous, but that’s what makes these small towns so appealing. There are no lines to wait on, no pushing or bumping to each other, no hustling and bustling; just enjoying the local history and culture is the main purpose of visiting these types of places. Malmo is just like that, a wonderful little town at the southern tip of the country, bordering with Copenhagen. The city is rich in history, culture, nature, and modern architecture…what else would you demand when visiting a new place? The locals here speak very good English as well as Finnish and little bit of German. Most of the places are within walking distance, but taxis are very cheap too. Talking about money and price, things are not as ridiculously expensive as in Denmark. Scandinavian countries are on the pricey side to begin with, but food, souvenirs, tickets or fees are very reasonable here in Malmo. 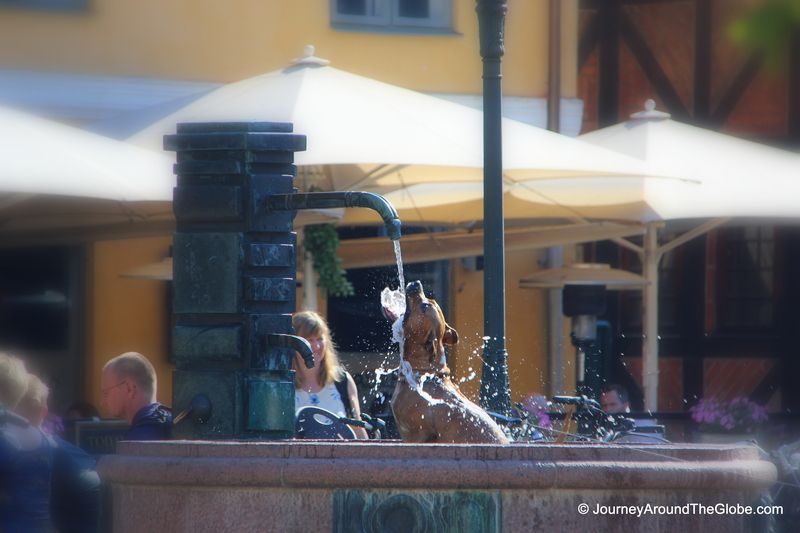 TIME OF OUR TRAVEL: Malmo was our 4th stop in our road trip during July 2012. Weather is usually pretty nice around this time of the year; sun sets down really late around 9:30 or 10 pm, so you get a lot done during this long time of the day. Summer is pleasant here, except for few days when it gets really hot, and that’s why you won’t see any AC in any hotels here. WHAT TO EAT AND BUY IN MALMO: We really haven’t tried any Swedish food yet. First two nights we ate in an Indian restaurant and had Chinese fast food for lunch. I am sure seafood cooked in Swedish style will taste great here, since it’s so close to the water. 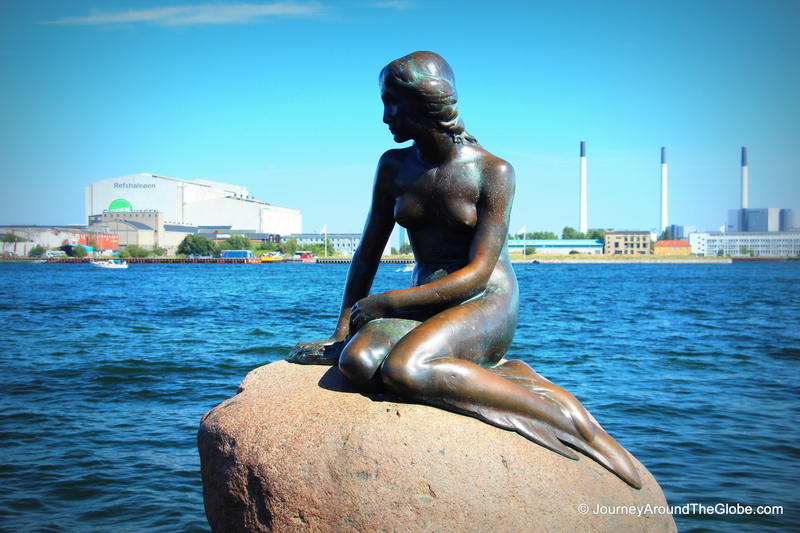 PLACES WE HAVE VISITED: We spent a whole day in Malmo and little bit of the next evening by the beach. This is a walkable city and most of the attractions are very close to each other or within short walk. The 3 main squares of Malmo are located at the heart of the city and are connected with pedestrians only shopping streets. 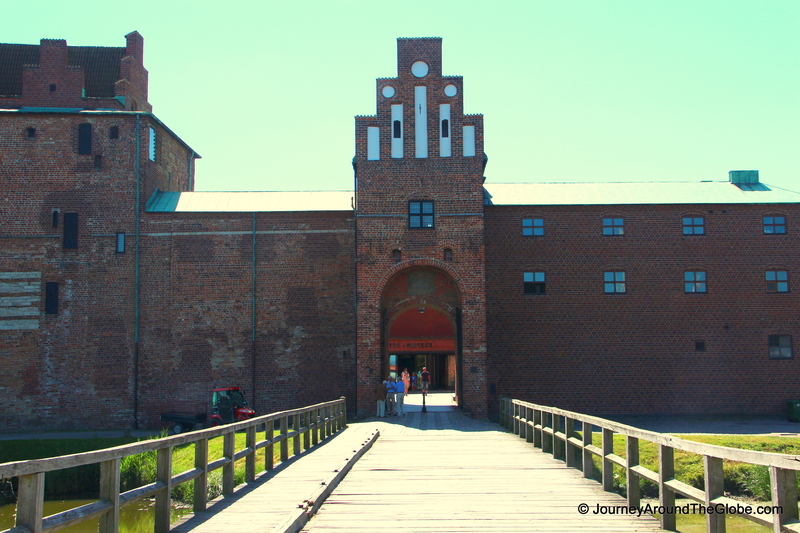 1) MALMO CASTLE (MALMÖHUS CASTLE): This is Scandinavia’s oldest surviving Renaissance castle. The castle was built in 1434 by Eric of Pomerania, king of Denmark, Norway, and Sweden (at that time a unified kingdom). The castle is one of the best places to unfold the history of Sweden and little bit of Denmark and Norway too. It also briefly tells you how Sweden broke away from Denmark centuries ago. The castle features some old rooms, decorated in very simple ways with very old and delicate furniture. 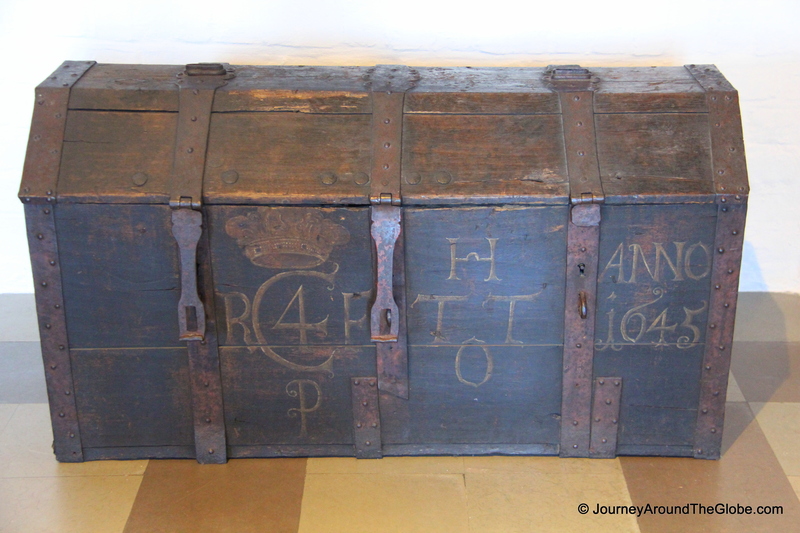 We saw some boxes/chests dating from the early 17th century. Denmark’s coins were minted here in the middle Ages and prisoners were beheaded in the courtyard in the 19th century. Presently, it houses a history museum, temporary exhibitions, aquarium, and other kids-related activities. Malmo Castle is located in the older part of the city. This is not a stroller-friendly place, especially when you are in the old part of the castle. The entrance fee for the castle is 80 SEK per adult and kids are free. The ticket includes castle, art gallery, history, nature, aquarium, Governor’s House (across the street), and Technical Museum for kids (within walking distance). It is a self-guided tour and takes couple hours to cover all the sections. 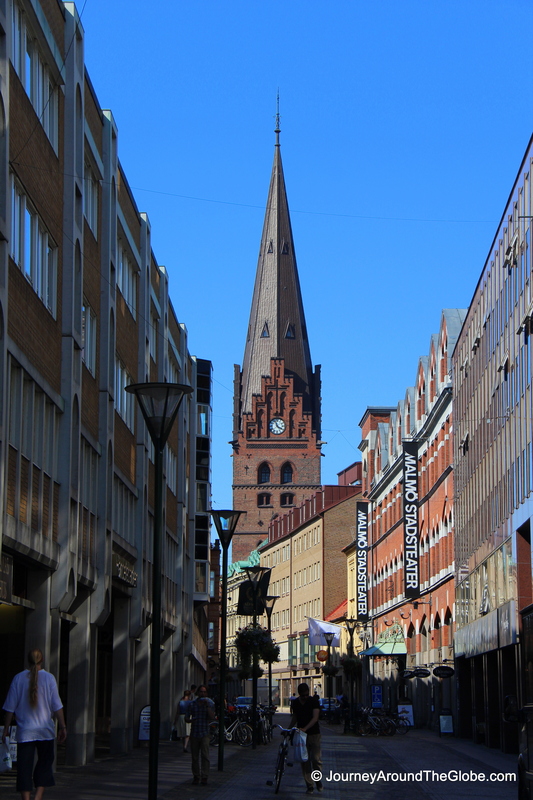 2) ST. PETER’S CHURCH (SANKT PETRI KYRKA): This is the city’s oldest church, dating back to 14th century. Inside is pretty nice with all white inside, very few stained-glass windows, ornate altar, and a huge organ. This Gothic style church has 344 feet (105 meters) tall tower. It’s located near the Big Square (Stortorget) and open from 10am – 6pm. 3) ST. JOHANNES CHURCH: This is probably the largest church of Malmo. There was a Baptist ceremony going on when we entered the church, so couldn’t really walk around during the event. 4) BIG SQUARE (STORTORGET) & MALMÖ CITY HALL: This is a huge place with statue of King Karl X Gustav on his horse, who took the city from Danish dominion, in the middle of the square. The square is not overwhelmed with hundreds of cafes and stores. There is a Burger King and Subway in addition to couple restaurants here and there. The spire of St. Peter’s Church can be seen be seen behind the town hall. This is about 10 minutes’ walk from Malmo Castle. An elaborated structure, Malmo City Hall, is located in one side of the square. 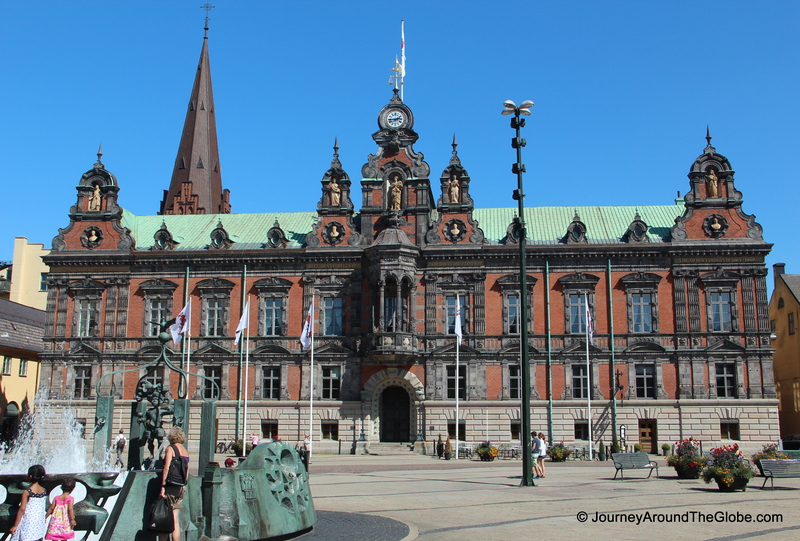 The building was built in 1536 and was the largest city hall in Scandinavia around that time. We didn’t go inside it, but the town hall is very decorative from outside. 5) LITTLE SQUARE (LILLA TORG): Lilla Torg is right beside Stortorget. This is cozier and prettier than Big Square with uniquely designed colorful buildings at the edges of the square. The square has tons of cafes with outdoor sitting arrangements and interesting stores. Surrounding small streets are fun to hang around too. This is definitely the place to have meal or some drinks and just chill. 6) GUSTAV ADOLF’S SQUARE (GUSTAV ADOLFS TORG): The square has lots of shops and fast foods like McDonalds, Burger King by the sides. The annual Malmofestivalen was going on during our visit in Malmo, which takes place in Gustav Adolf’s Square. Visitors get to try food from every nation here. It seemed like a party place there, everyone was enjoying the diverse atmosphere with good food and ethnic music. 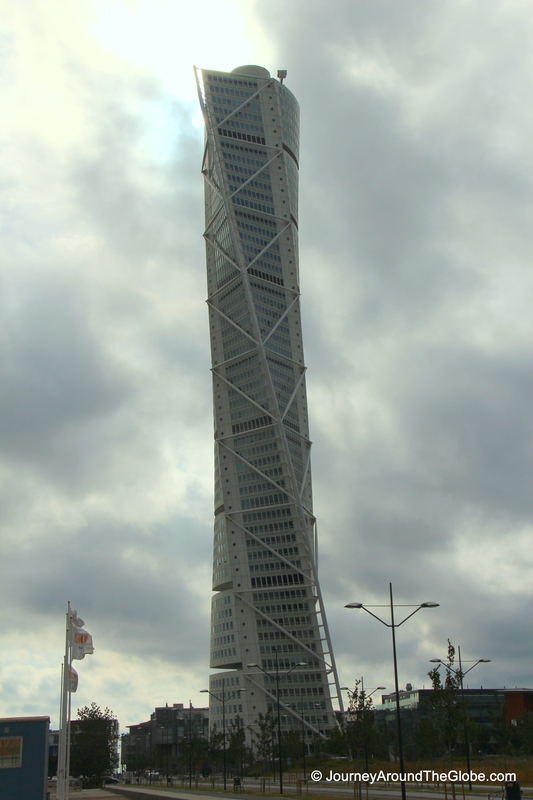 7) TURNING TORSO & SCANIA PARK (MALMO BEACH ARENA): Turning Torso, the tallest building in Scandinavia, is one of the examples of modern architecture of the town and of Scandinavia. This 54 storied building (623 feet tall) was open in 2005. This spectacular apartment building is situated near Malmo Beach Arena and can be seen from almost anywhere in the town. I am not sure if you can actually go on top of the tower or not, so it’s probably best to appreciate this art of technology from afar. Malmo Beach Arena is a nice place by the beach away from city life. This is not a typical beach where you can go swimming and do sun bath. There is a specific place to go diving, which is about 4.5 meters deep. But it is a nice place to go for a stroll or jog alone or with loved ones. 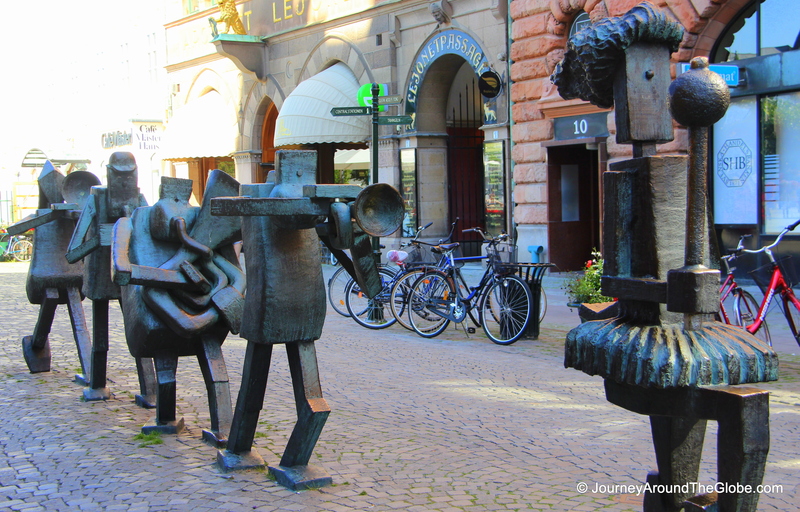 8) TRIP TO LUND: Lund is another small Swedish town, only 20 – 25 minutes’ drive from Malmo. 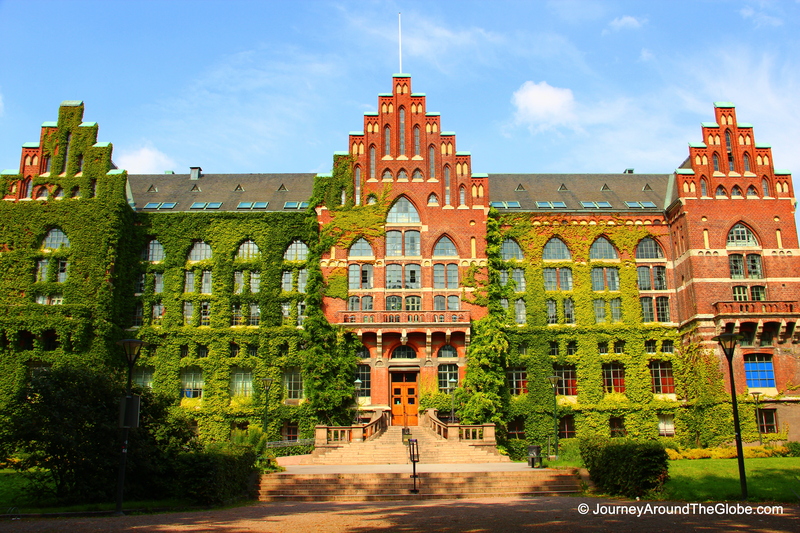 This is a typical university town and out of all the chaos of its nearby city Malmo. There are not too many things to see or do here, other than just enjoying the beautiful city. This is a great getaway while in Malmo. 9) TRIP TO COPENHAGEN: If you are in Malmo, going to Copenhagen is a must. The drive is less than an hour by car and you get to enjoy the beautiful, long Oresund Bridge on your way. Only thing is that cars have to pay $50 or 310 DKK one way to cross the bridge. But once you are in Copenhagen, it’s all worth it. The city has many castles, famous churches, historical landmarks, beautiful canals, and many other things to offer to its guests. Just keep in mind that things in Copenhagen cost more compared to Malmo. 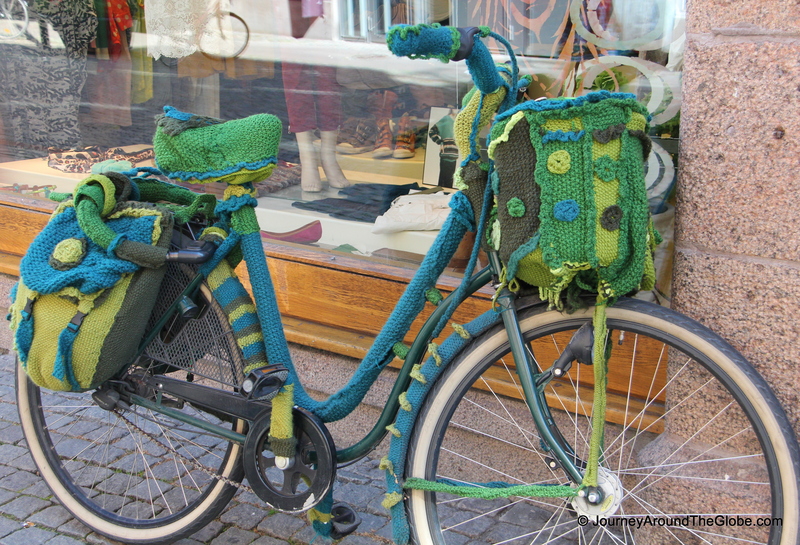 I LOVE the bike wrapped in knitting!